Popped in whilst on a bit of a wander round the city. Had Hilden Belfast Ale on. Now seems to be called Brennans bar. The interior decoration is a bit 80s & the music is way annoying - but the food is great. Good retreat option when the tourists take over The Crown next door. 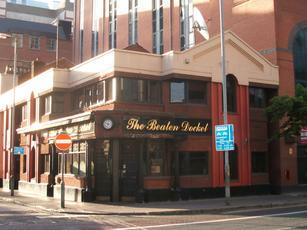 Now I can say I have been to both of the Beaten Docket pubs listed on beerintheevening! I've walked into both shortly after opening time and this one was much quieter at this time than its Cricklewood counterpart. There was only one other customer in the pub. So we had the choice of tables and barmen (three of them reading newspapers). There's no real ales here. I could imagine this place being extremely busy and loud each evening. But why visit here when the Crown is next door? Decent pub with nice decor and, I believe, an upstairs dining room. Lives in the shadow of the Crown and Robinsons next door but can be a haven of calm if you are after a quiet pint. No real ale.